The trend inspired decorative nature can make you happy, because there are many alternatives to apply to your home and bring it into line with the colors and shapes that nature has created with its mystery. Today I will show you a living completely inspired in the woods to make you feel in a story of adventure of those you read when you were younger. 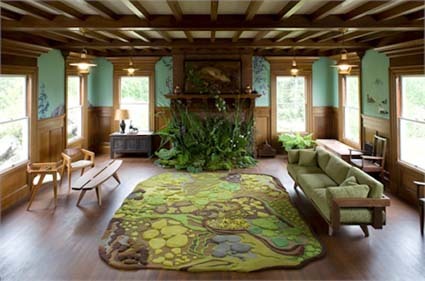 This hall has a wooden ceiling panels that are unified with the parquet floor giving prominence to green elements such as walls, sofa, flower arranging protruding from the fireplace and beautiful carpet. 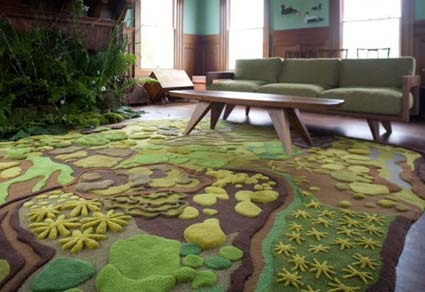 In a different perspective you can see how the carpet becomes the protagonist of the place with a design of flowers and green algae, brown and yellow, with a special texture that makes it stand out the designs making them look even more fluffy. A coffee table wood modern sofa and pastel green three places where you can sit and relax and transport you to a new place full of harmony and with just a little imagination. This entry was posted in Hall Room and tagged hall room interior, lounge forest decor. Bookmark the permalink.